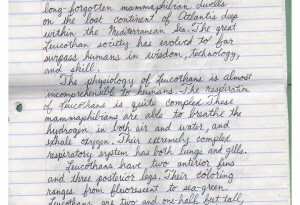 I wrote this paper for Marine Biology class; it was turned in on 5-20-94, according to the cover. That would have made me a 15 year old sophomore. 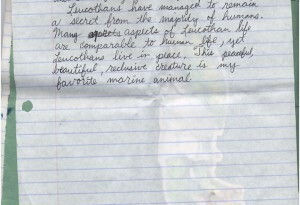 After re-reading the paper, I surmised that the topic was our favorite marine animal. For some reason, I didn’t go with an actual existent marine animal, and instead made up one. That said, as you can tell from page 1, I made a 95 (A). 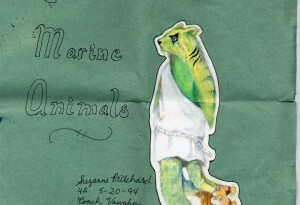 I have no idea why a paper on a pretend marine animal would warrant an A. Maybe my teacher just didn’t want to point out that I didn’t follow directions very well. The ocean is filled with a wide abundance of marine life. My favorite marine animal is the Leucothan. This long-forgotten mammaphibian dwells on the lost continent of Atlantis deep within the Mediterranean Sea. The great Leucothan society has evolved to far surpass human in wisdom, technology, and skill. The physiology of Leucothans is almost incomprehensible to humans. The respiration of Leucothans is quite complex. These mammaphibians are able to breathe the hydrogen in both air and water, and exhale oxygen. Their extremely complex respiratory system has both lungs and gills. Leucothans have two anterior fins and three posterior legs. Their coloring ranges from florescent to sea-green. Leucothans are two and one-half feet tall, and have three toes, but they always wear platform shoes with suction cups so they can walk on the ocean bottom. The great land of Atlantis, in its prime, was advanced far beyond anything humans have known. The people of Atlantis were peaceful, and early on in their existence had recognized all animals as living souls and treasured each life. This deep respect for animals opened relations between the leader of the people and the leaders of the various animal species. 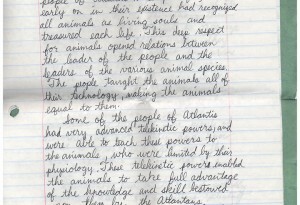 The people taught the animals all of their technology, making the animals equal to them. Some of the people of Atlantis had very advanced telekinetic powers, and were able to teach these powers to the animals, who were limited by their physiology. These telekinetic powers enabled the animals to take full advantage of the knowledge and skill bestowed upon them by the Atlantans. After the sinking of Atlantis, because of a war between the greedy mermaids and the once-peaceful Atlantans, the reclusive Leucothans were the only survivors. The Leucothans erected water-tight, air-filled biospheres, so they could live in the air without living above their home, the sea. They continued to build a great empire out of the ruins of the once great Atlantis. 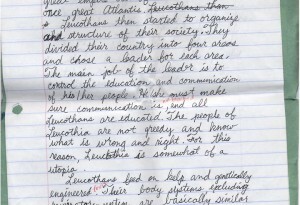 Leucothans then started to organize and structure their society. They divided their country into four areas and chose a leader for each area. The main job of the leader is to control the education and communication of his/her people. He/she must make sure communication is not blocked, and all Leucothans are educated. The people of Leucothia are not greedy and know what is wrong and right. For this reason, Leucothia is somewhat of a utopia. Leucothans feed on kelp and genetically engineered fruit. Their body systems, excluding respiratory system, are basically similar to a humanâ€™s. Leucothans have no hands, so their telekinetic powers have become very advanced. Everything humans do with their hands need only be thought by a Leucothan, and the task gets done. These powers account for how Leucothans were able to create a beautiful environment to live in and successfully genetically engineer fruit. Leucothans have managed to remain a secret from the majority of humans. Many aspects of Leucothan life are comparable to human life, yet Leucothans live in peace. This peaceful, beautiful, reclusive creature is my favorite marine animal.